In the celebration of Christmas worldwide there are endless varieties of collectibles for the season. We will be somewhat concentrated on Scandinavia on this page, but that does not exclude a wider appeal. 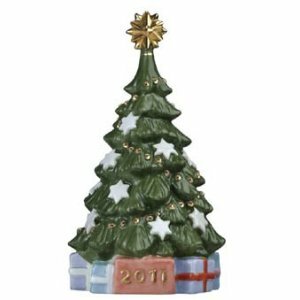 Bing & Grondahl and Royal Copenhagen, both companies located in Copenhagen, have for years held the attention of collectors with their annual issues (of limited quantities) of collectible christmas items. Her literary fame has established her as one of the great figures in the history of Denmark. Books written under the name of Isak Dinesen, among them "Out of Africa", have established her worldwide reputation. We will show one of the items created in her memory here. She wrote the book "Out of Africa" at Rungstedlund, her ancestral home near Copenhagen, Denmark. The 2010 collection of Christmas gifts is dedicated to Rungstedlund, part of the proceeds will support new exhibits. Rungstedlund is now a museum honoring the memory of the author. No one since her fellow Dane, Hans Christian Andersen, has displayed such a rich and formidable talent for storytelling. And Karen Blixen had the ability to write in English, not her native tongue. Her extensive education and her experiences in Kenya, where English was the official language, developed in her the command and eloquence in English. It is evident in her many books, foremost among them "Out of Africa". Denys Finch Hatton, the English aristocrat that befriended her in Africa, was one of the reasons she acquired her command of English, not just basic English, but eloquent English. "Out of Africa" is one of the most quoted books when literature and the magic of Africa is discussed. 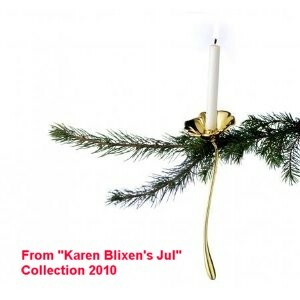 It is no wonder then that fellow Danes have decided to honor her memory by the unique Christmas Collection, Christmas Gift Designs, in Danish "Karen Blixen's Jul". ("Jul" in Danish means Yule or Christmas). In 1908, Royal Copenhagen, Denmark's oldest porcelain maker, followed Bing and Grondal's example by producing its own series of Christmas plates. Like the Bing and Grondal plates, these were of the blue and white colors with the date and occasion of issuance fired permanently into the porcelain glaze. The blue and white colors of these keepsakes are appropriate symbols of the season – white or purity and blue for the heavens. Both firms use one of the most difficult ceramic techniques, that of underglaze painting. After the artist paints the scene, the plate is dipped in glaze, completely obscuring the decoration. When the plate is fired in the kiln, the scene reappears. A design for Christmas plate may be submitted by any employee of the porcelain house. On Christmas Eve the mold for that year is broken, never to be reproduced. Through the years, the Christmas plates have told the story of Denmark and offered to the world a glimpse of the customs and traditions of the Danish Christmas "jul". While most designs have been simple and charming, a few have been very serious. The 1944 design, for example, protested the Nazi occupation of Denmark by showing the "Sorgenfri" castle, where King ChristianX, who refused to cooperate with the enemy, was held prisoner by the Germans. Christian X helped facilitate the escape of nearly all Danish Jews to neutral Sweden. 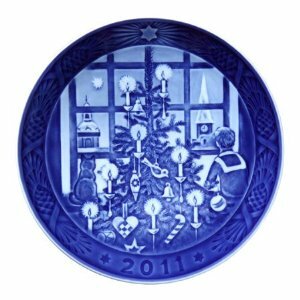 For over 90 years "Juleaften" plates have pictured Christmas in Denmark to the world. The 1911 Royal Copenhagen plate depicts a sheaf of grain hung out for the birds, an ancient Scandinavian Jul custom.